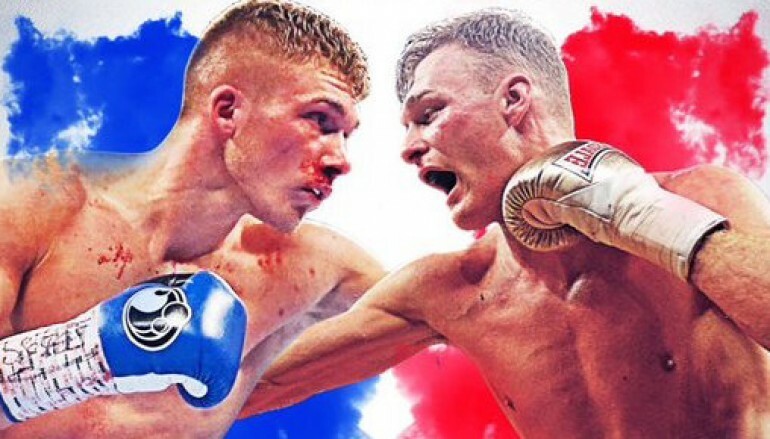 Earlier tonight, Nick Blackwell (19-3-1, 8KO) successfully defended his British title with a Unanimous Decision win against Blackpool’s brave Jack Arnfield (19-2, 4KO). The middleweight, aptly named ‘Bang Bang’, returned to the City Academy Sports Centre and made his first appearance in his home region of the West Country for 19 months. All three judges scored in favour of Blackwell, courtesy of 117-111 (John Keane), 117-1110 (Ian John-Lewis) and 115-112 (Marcus McDonnell) cards. Headlining a joint promotion between Hennessy Sports and Sanigar Events, Blackwell once again thrilled viewers on Channel 5, the only terrestrial outlet regularly broadcasting boxing and a brave Arnfield more than played his part. Blackwell was guilty of starting slow in his two previous British title fights, before turning the tide around to dramatically stop John Ryder and Damon Jones. However, he couldn’t be accused of a cold beginning this time, landing a crisp right cross in the opening 30 seconds. While Arnfield sustained a high early output, it was mainly taken on the gloves and Blackwell looked to reply with sharp single shots. Some shots did get through though and Arnfield picked accurate uppercuts in the second round, finishing the session by landing a flush left hook. The champion looked to boss the early exchanges with menacing feints to close down Arnfield’s movement but the challenger remained composed and comfortable. Blackwell made his first significant mark by the end of the third round, which Arnfield finished with a body nose. In the fourth round, 25-year-old Blackwell made progress in his task to shorten the distance to mid and short-range, nullifying the height and reach advantages owned by Arnfield, who stands at over six foot tall. A flush right cross appeared to rock Arnfield and Blackwell’s follow up attack drew blood from Arnfield’s injured left eye. It was Blackwell’s third fight under the guidance of leading Welsh trainer Gary Lockett and arguably, his most complete yet. The Trowbridge native’s pressure proved to be temporarily too much in the fifth round, forcing Arnfield to the canvas with a left hook to the body. Arnfield’s only previous defeat came in a Prizefighter format, where combatants face three-three round fights on the same night. 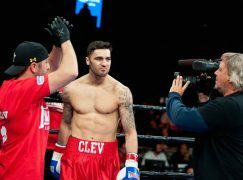 The 27-year-old had been due to rematch the only man to beat him in a British title eliminator but Cello Renda was forced to withdraw due to injury. Eager not to suffer a more legitimate and recognised defeat, Arnfield dug in after being dropped but was coming off second best, testament to Blackwell’s power. Days after Renda’s withdrawal, Elliot Matthews was cut in sparring and ruled out of his challenge to Blackwell, meaning Arnfield received a call from his manager Steve Wood to step in with just one week to go. Anfield’s bravery was never in doubt and neither was his durability as he survived another strong wave of attack from Blackwell at the end of round six. Arnfield, who linked up with new trainer Michael Jennings four months ago, was evidently well drilled by the former world champion and as expected, opted to utilize long straight shots, circling the edges of the rings. The smart tactics were too often disrupted by Blackwell’s pressure, though and by the halfway mark, Blackwell was in the ascendency. The culmination of Blackwell’s educated pressure and just 14 rounds in two years appeared to be catching up with Arnfield as the bout entered the final third phase. In an attempt to make enough space to stay a step ahead of Blackwell, Arnfield often experimented with a switch to southpaw. Initially, that change did have it’s desired affect in rounds eight and nine but neither sessions were secured. Arnfield, not known for his power, was now throwing mainly arm-punches and it wasn’t enough to deter Blackwell’s non-stop approaches. Entering the championship rounds, it was Blackwell who had the extra energy and he was under instruction to pour on more pressure. He did so, firing strong double jabs and following them up with right crosses. It kept Arnfield moving across the ring but he was now on an increasingly involuntary retreat until the final bell. Blackwell is now one successful title defence away from owning the Lord Lonsdale belt forever. Earlier this week, the British Boxing Board of Control [BBBoC] ordered the winner of tonight’s fight to defend their belt against Chris Eubank Jnr (20-1, 15KO) by the end of March.